Since spring in Colorado can keep you on your toes, I feel pretty good about using a mix of my existing wardrobe to fill the needs of the day. Where I do need to add to my options is in the pants department, so I’m planning on making a pair of Lander Trousers in a rust colored woven I have in my stash. I’m also considering making the Ladies Caroline Dress in a turquoise cotton for Easter. I’m more excited to get to sewing my summer capsule. A lot of this may look familiar from last years summer plan. First up will be Simplicity 8386. I have a cute jersey with zebras that would make it fun. I see this one going all wrong fast, so I’ll definitely be making a muslin first on this one. My wardrobe is missing woven tanks, so McCalls 6751 is back on the list. I’m not sure how to pull this off with a bra. I think I’ll need to make a bandeau to wear with it. I’ll be making one more pair of the Chi Town Chinos shorts. I may give the Lander Shorts a try too. The Rose Circle skirt became a fast wardrobe staple for me last year, so I’ll be making one in burgundy DBP to pair with the S8386 top. 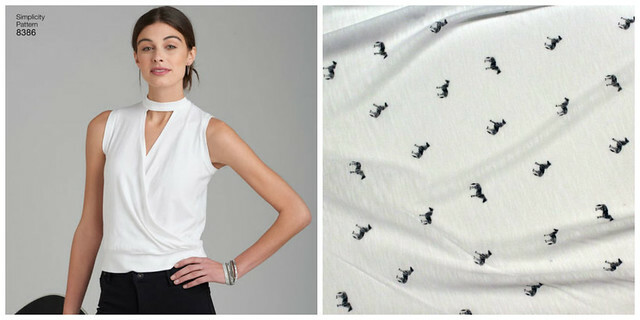 What’s on your sewing plan for spring/summer? and pretend we can sew up all that our hearts desire this fall. You’ve seen that I’ve already started my fall sewing, but there are still quite a few patterns I’m dreaming about for this fall. I think I can modify my Toaster Sweater pattern to achieve this look. Finally something to top it all off. Please share with me what you’re dreaming of making this fall. As always, thanks for stopping by the blog today. I usually plan out my sewing schedule ahead in three month bursts. It helps me to prioritize what I want to make for the next season and keeps me on track in many ways. Instead of my typically well planned out and detailed sewing schedule, the last months I have really struggled to put my sewing plan together. I’ve just accepted that my typical method is not going to happen right now and I should give this just winging it thing a try. I do have some very loose ideas to use my pattern and fabric stash for summer. Maybe you’ll see these this summer maybe you won’t. I’m most excited to sew up Simplicity 8386 that I just picked up. I have a cute jersey with zebras that would make it fun or maybe I’ll keep it more sophisticated in a solid color. A few woven tanks would be great and I have several stash patterns to try. McCalls 6751 but not sure how to pull this off with a bra. I think I’ll need to make a bandeau to wear with it. I’m in need of shorts in some basic colors. The Chi Town Chinos are my favorite shorts pattern right now. I’ve already made up a pair in mustard and oat this month, but want a few more pairs. What’s on your sewing plan for summer? The Ch-Ch-Changes tour (hosted by Sewing by Ti) is all May long and my fellow bloggers and I are talking about changes to our sewing. Whether the change is a transition for the season, getting more organized, trying new things, reconsidering old things, or styling things. At the begining of April my sewing plans and schedule reached their end and I’ve really struggled with putting together my next three month plan. It’s mid-May now and I still have almost nothing planned and find myself in a new place; finishing a project and then deciding what to do next. For this very organized and it’s fair to say regimented sewer, this is very strange and unsettling territory. So I’ve been addressing the immediate. 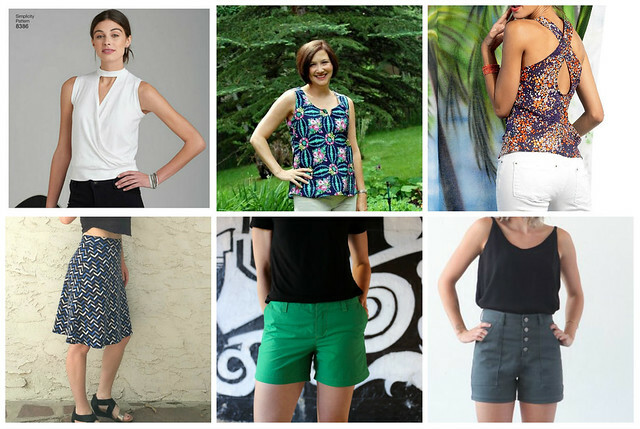 I’ve been filling wardrobe holes by sewing up some additional shorts for spring and summer. Sewing for the transitioning seasons isn’t a noteable change for me, but being less organized about it is a big change for me. On a whim, I joined the tour and decided to make up another pair of Chi Towns to go with the Onyx shirt I made last year. 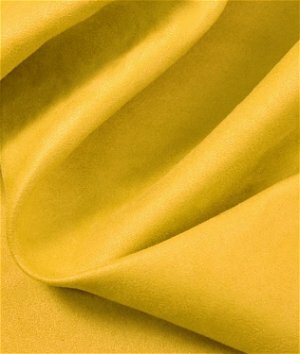 I’ve had this mustard yellow linen I received from Sew Vagabond Shop in my stash waiting to make these. I sized down and made a few fitting tweeks to the pattern and viola. I’m thankful for another summer outfit and think I can use these mustard shorts with a lot of my existing tops. With a trip coming up to warmer weather, I very quickly decided to make another pair of Chi Towns using a putty colored linen/blend from my stash. Other than having to fix the same spot on my topstitching 4 times, the second pair went together very quickly. I can see the benefit of sewing multiples of a pattern in succession. Perhaps I need to consider this when I get back to my normal routine. 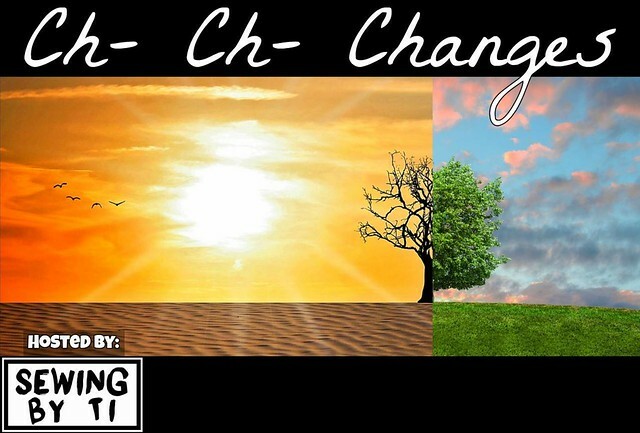 Do you have any Ch- Ch- Changes going on this spring? You can see what other bloggers on the tour have been talking about on the Ch- Ch- Changes themes. Please pay a visit and join the conversation. 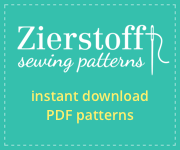 I’ve been spending a lot of time looking around the Zierstoff Patterns website while getting the Fun with Zierstoff events ready for this month and I keep finding more and more patterns I want to try. Since I can’t barricade myself in my sewing room and shirk all responsibilities for two weeks to sew all I want. I’m going to share what I’m thinking about and some fabric inspiration. Maybe you’ll make one of these and I can live vicariously through you. The biggest surprise to me is the HENRIKE. I always imagine jumpsuits working best for the tall and lanky and therefore NOT me, but I cannot stop looking at this one. Dare I try it in some black brushed poly or this Navy & Pink Chevron? I already have some leggings in this chevron, so I know it is awesome. I’m a big fan of hoodies, though I rarely pull the hood up. The EMIL hoody has a snap/button front opening for extra room and opportunities for added color. Go classic with the Nautical Stripe French Terry paired with the Pearl Rayon knit as lining from Sew Vagabond. 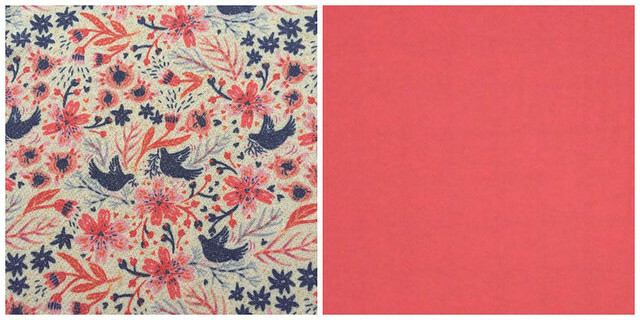 Go feminine with the Vintage Aviary French Terry paired with the Coral Pink rayon jersey as lining. For the boys, I keep coming back to the DAVID. 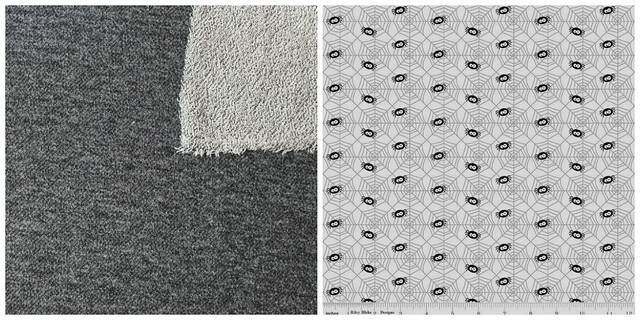 I think my little guy would like this Black Heathered french terry and Spider Web jersey from Raspberry Creek Fabric. And oh my, I love this new EVERY DAY bag. This pink version is so cool, but how about a yellow microsuede paired with tanned leather handle and corners. That’s what’s been on my mind this week. Welcome friends, I’ll be your M.C. 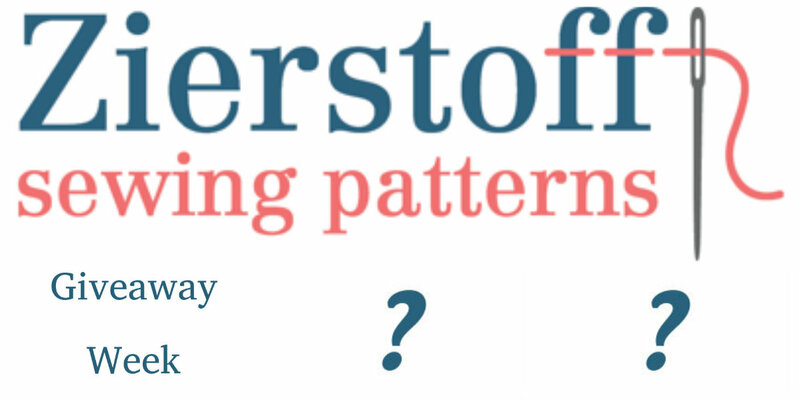 for fun with Zierstoff Patterns over the next few weeks. We have some giveaways lined up and then a really fun event. 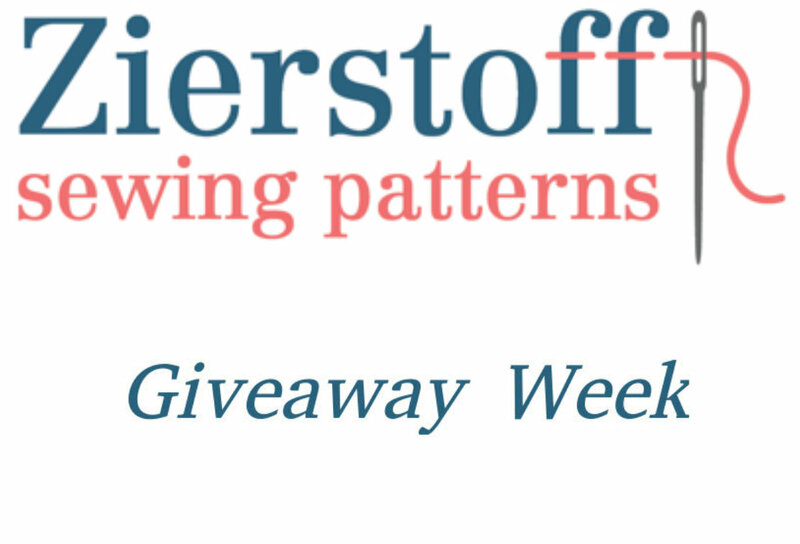 To start things off this week, Zierstoff is giving away two 10 Euro vouchers to Etsy. Oh the the goodies you’d be able to choose from: fabric, patterns, notions, or you know…anything. One of the giveaway options is to complete a survey. The gals at Zierstoff would really like you to take a look around the Zierstoff site and share what you think, so I’m giving you extra entries for doing so and my sincere thanks too. Don’t be shy, take a good look. Make sure you’re following the mahlicadesigns blog so you don’t miss out on the fun that’s happening next. 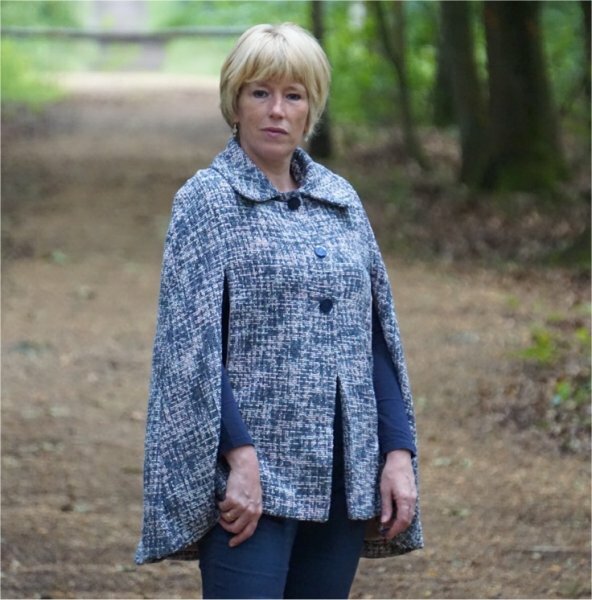 Welcome back to Watcha’ Wearin’ January, a blog tour all about inspiring you to get your sewjo back after the holidays. 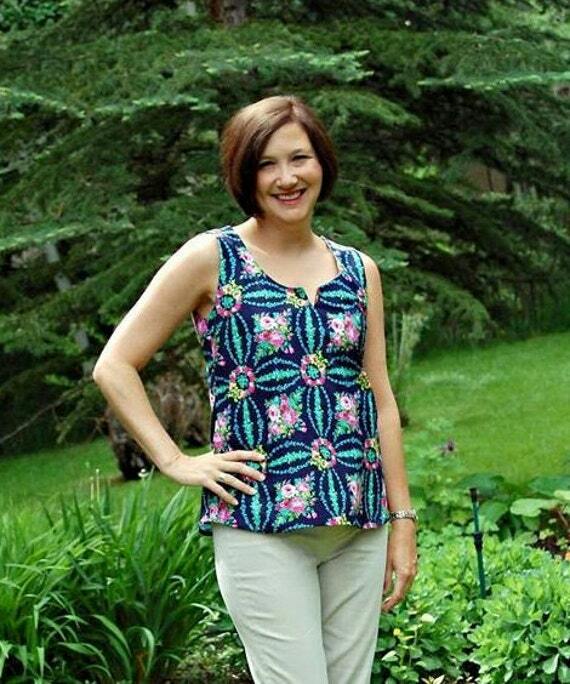 Our host, Sewing by Ti has bloggers lined up for almost everyday this month to help you along. January is cold here in Colorado and I hate to be cold in general, so I’ve been wearin’ LAYERS. 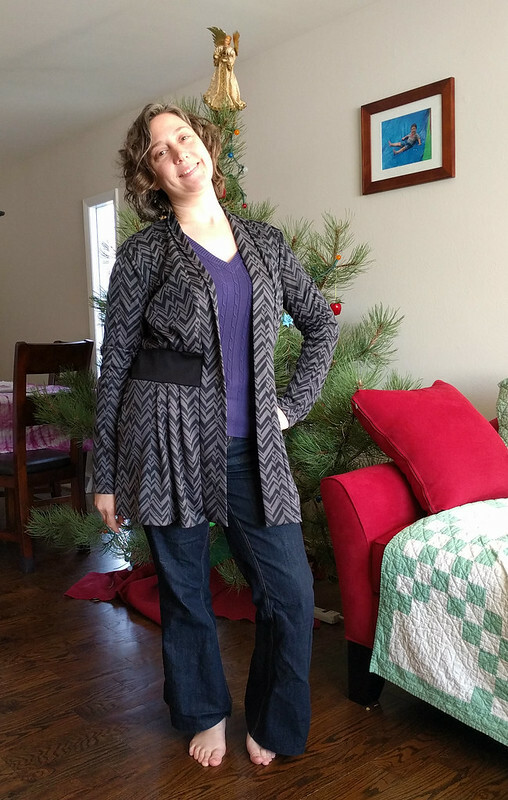 I’ve been wearing my Melissa Cardigan from Zierstoff Patterns a lot. It’s the perfect fit for me and the collar gives me just a little extra coverage on the back of my neck. Melissa Cardigan paired with a tee and skinny pants. 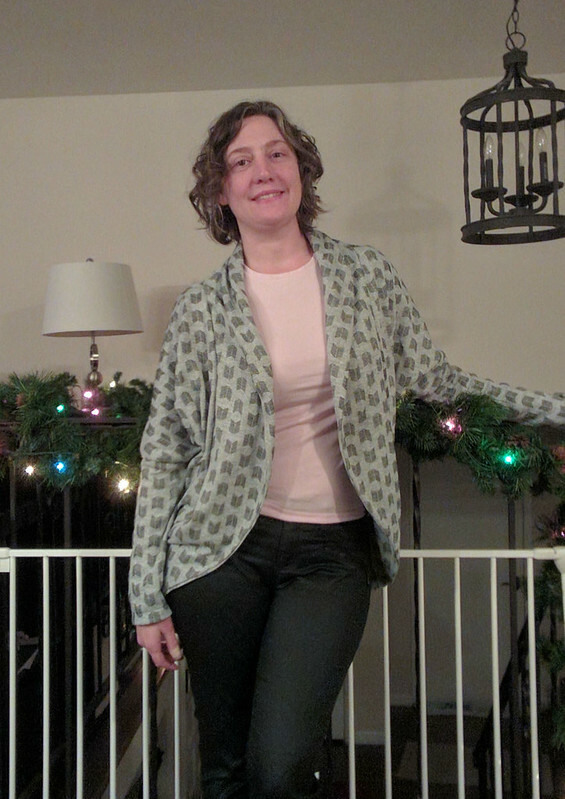 Melissa Cardigan paired with my Tonic Tee hack and Liana Jeans. I’ve worn my new Paro Cardigan from Itch to Stitch four times since I made it a couple weeks ago. Paro cardigan paired with rtw sweater and my Birkin Flares. This is not my favorite outfit honestly; the flare of the cardigan and the flare of the jeans are just too much. Much better with skinny jeans. 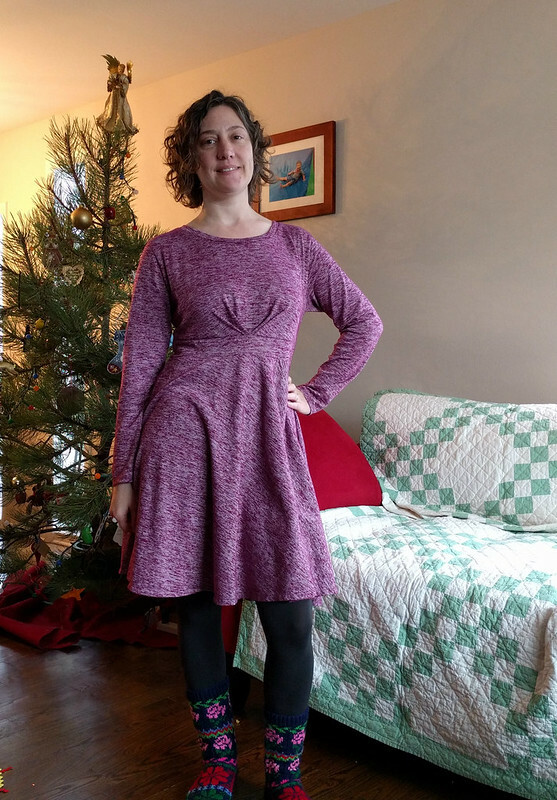 Last Sunday, I wore my Capitol Hill dress from Straight Stitch Designs, tights and boots for church. Once we got home I layered on these hand knit slipper socks that I got in Kyrgyzstan years ago and really never worn. I’ve been afraid to mess them up by wearing them, but collecting dust on the shelf is no good either. Yeah, we still have our Christmas tree. It’s coming down this week. 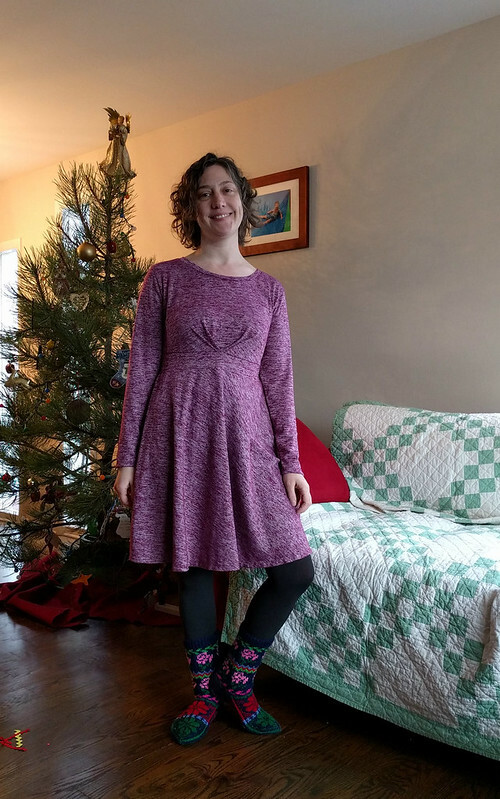 Typically I just pile on the layers with little care about making an outfit, but the pink flowers on the slipper socks go nicely with the dress so I’m counting this a combo that works. Want more January inspiration? Please check out what this week’s bloggers have prepared for you. Oh, and add what you’re wearing this January to the link up for a chance at the big prizes.